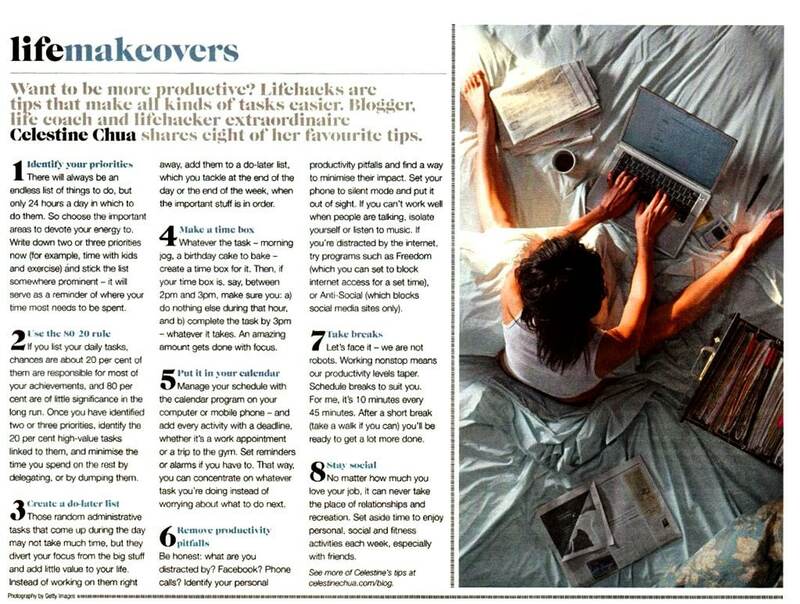 Just last month, I was invited to write an article for The Sunday Life (a supplement that’s distributed as part of The Sun-Herald and The Age) on how to live a more productive life. The article below is the result! For readers in Australia, you can find the article can be found in the “Life” supplement in The Sun-Herald (for those in Sydney) and The Sunday Age (for those in Melbourne), page 27 (out of 40 pages). The Sun-Herald has a readership of 1,159,000 (as of December 2009), while The Sunday Age has a readership of 695,000, so that’s nearly 2 million people in total! Its target audience is generally more educated and affluent readers, so it’s definitely in line with the readers we want to reach out with PE. So a special thank you to The Sunday Life for this opportunity! Be sure to check 8 Habits of Highly Productive People – a timeless Personal Excellence classic I wrote in 2010, which is a site hit as well. Check out the media section for a list of our past media coverage. Thanks to all media outlets for the publicity!